Electrical Safety Switches ( RCD’s ) and what you need to Know ! The Installation of RCD Safety Switches in your meter box or distribution board and testing them on a regular basis is a small investment in money and time that can massive dividends if it just saves one life . It will provide long term protection for you and your family against serious injury and death. Jobs that might be done any day such as screwing shelving into a wall or using an electrical appliance can turn deadly without the protection of a RCD Safety Switch. 15 Australians are killed in preventable home electrical accidents each year and around 20 times that number are hospitalized with serious injuries. What is a RCD Safety Switch? RCD’s (Residual Current Devices) or Safety Switches are designed to provide a fast power cut- off in situations that may cause an electric shock , their prime aim in life is to protect you. Electrical hazards are often hidden and can be difficult to identify, such as a small hole in an extension lead or a power board damaged internally. Electrical accidents occur in an instant and RCDs are the only device that can protect you and your family from these hidden dangers and give you a second chance. How does an RCD Safety Switch work? An RCD Safety Switch does its job by constantly monitoring the current flowing in the Active and Neutral wires supplying a circuit or an individual item of equipment. Under normal circumstances, the current flowing in the two wires is equal. When an earth leakage occurs due to a fault in the circuit or an accident with the equipment, an imbalance occurs and this is detected by the RCD, which automatically cuts off the power before injury or damage can result. RCD Safety Switches are extremely sensitive, disconnecting in under 30 milliseconds of detecting a leakage current. This stops the flow of electricity through someone’s body to earth. Importantly, this response time is much faster than the critical section of the cardiac cycle and therefore significantly reduces the risk of death or serious injury. RCDs also protect against fire caused by faults in appliances, tools and wiring. If these faults go undetected they could cause a fire or personal injury. These are generally located alongside circuit breakers in the main meter box or distribution board of the residence. These devices protect the electrical circuits and appliances as well as preventing electrocution and are an attractive option for retro-fitting into existing meter boxes with little or no spare space. These attach to a power board or extension lead and only protect the circuits of appliances connected to them. They are essential for people using power tools or electrical appliances outside that are not protected by a meter box RCD or power point RCD. Are fitted to a power point and can be distinguished by the test button on the face plate. They must be fitted to the first power point after the meter box. They are suitable for protecting electrical appliances in specific areas such as bathrooms and workshops. RCD Safety Switches are required by law to be fitted at the origin of the power and lighting circuits which will be at the main meter box or distribution board for the residence. They can be identified by the test button on the front of the device. Since 2000 it has been compulsory for all new homes to have a minimum of two RCD Safety Switches fitted to protect the power and lighting circuits as part of the electrical installation. However, homes built before 2000 were not required to have two RCDs fitted and from 1992 to 1999 only one RCD was fitted, which will not ensure complete protection for your family. One RCD is likely to protect only the power circuits and leaves the lighting circuits unprotected. 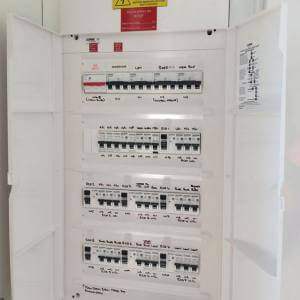 If you are unsure whether you have RCD Safety Switches installed or you need them installed contact us on 0416 226 457 or at admin@allthingselectrical.com.au and we can send a Qualified Electrician around to supply and fit your RCDs. What is the difference between an RCD Safety Switches and a Circuit Breaker? An RCD Safety Switches looks similar to a Circuit Breaker but it has an additional test button. Many homes already have circuit breakers installed, however circuit breakers only protect against overloading and short circuits they do not prevent electrocution. To ensure that the RCD Safety Switches fitted to your home perform correctly, they must be tested at regular intervals. AS/NZS 3760 2010 recommends that each RCD be tested every three months or if using a portable RCD a push button test should be performed before each use by the operator. To test your RCD Safety Switch press the ‘test’ button on the front of the device and then release it. The button will only test the RCD if an electricity supply is connected. Pressing the test button will simulate an earth leakage fault and indicates whether the device is operating correctly. When an RCD Safety Switch operates all power is lost to the equipment, power point or circuit protected by the RCD. To restore power simply move the “on/off” switch back to the “on” position. Electrical clocks and timing devices may have to be reset. A licensed electrical contractor is the best person to assess if your RCD Safety Switches meet the regulations. However, you can do a simple check to determine if your residence is protected in accordance with the new legislation as follows. Plug a small lamp into a power point and make sure it works. Leave it turned on. Make sure that electricity is connected to the property and the main switch is in the on position. The lamp should be on. Push the test button on each RCD Safety Switch. Do not hold your finger on the test button. The RCD Safety Switch should operate (turn off). If it does not operate, it must be checked by an electrical contractor. After pushing the test button and the RCD Safety Switch have turned off check that the small lamp is now off. Also check that all the lights and power points do not operate. To do this, plug the small lamp into all the power points and turn the power point on. If the lamp turns on a licensed electrical contractor must be engaged to correct the wiring. When finished testing, turn the RCD Safety Switch back on and check that the lamp works when plugged into a power-point. In most cases of RCD Safety Switch tripping it will concern appliances or situations that involve at least one or a combination of three conditions, all of which requires a licensed electrician to rectify. 1. Moisture causing electricity to leak to earth in an appliance or within premises wiring. 2. A heating element that is either faulty or drawing sudden electrical surges. 3. An appliance with an electric motor that is either faulty or drawing sudden electrical surges. If you have trouble with constant or intermittent RCD Safety Switch tripping or if you wish to have RCD Safety Switches installed in your house, contact us on 0416 226 457 or at admin@allthingselectrical.com.au and we can arrange for a licensed electrician to come to assist you.